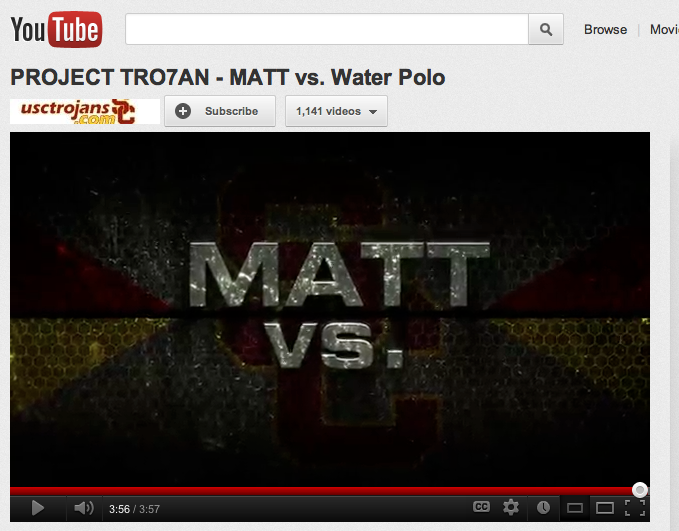 I know I’ve blogged about this before, but the USC athletic department’s “Matt vs.” video series is pretty awesome. For those of you new to the series, USC quarterback Matt Barkley and some of his teammates have been competing against other USC athletes in their sports. In this week’s video, Matt and defensive captain T.J. McDonald got some pool time with the 4-time defending national champion USC men’s water polo team. You heard me… a couple of novices playing alongside the national champs. I’ll be honest, none of the videos I’ve seen have been hilarious, but they’ve all been entertaining. The idea is to show another side of Barkley and his teammates, highlighting their personalities off the field. The end result is something business leaders need to pay attention to. Any business could do this sort of thing. Who’s the public face of your company? Why not a series of videos where that person takes on someone else’s job at the company? They go work in accounting, the mailroom, etc. The end result is a double-barreled hit. First, it makes that public face more endearing. A little humility and self-deprecating humor go a long way to getting prospects and the rank-and-file to warm up to them. Are you listening CEO’s? Second, the video highlights the work of other team members. How many times is Janet in accounting or Phil in the mailroom going to be made to feel special? They get a boost and other employees see their co-workers being singled out. The whole series would be great for morale. USC quarterback Matt Barkley lost this week. Now, if you’re a college football fan, you might be a bit confused right now. Didn’t Barkey tie a school record over the weekend by throwing 6-touchdowns en route to a win over Syracuse? Yes. 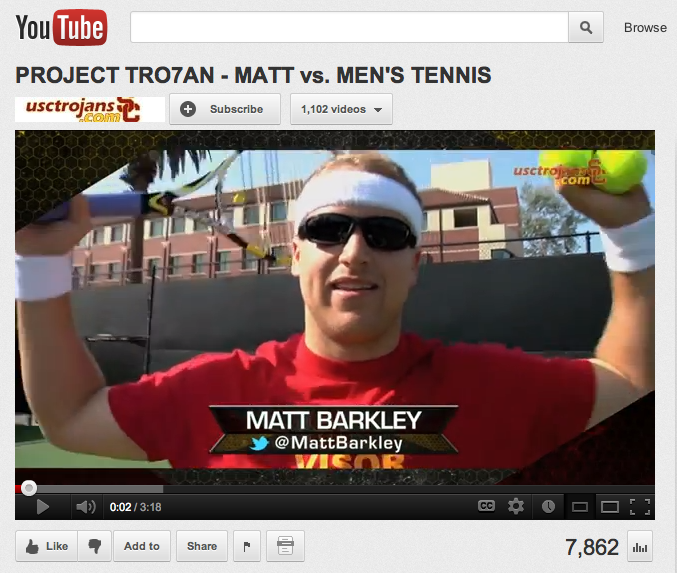 Barkley continues to impress on the football field, but on a tennis court… not so much. As part of USC’s YouTube marketing/public relations campaign, the school posted a video last week of Barkley and his center, Khaled Holmes, playing doubles tennis with a pair of USC tennis players. FYI… USC has won the last four NCAA Championships in tennis. In other words, the Trojan tennis team is pretty good. Anyway, while Barkley might be the frontrunner for this year’s Heisman Trophy, he’s not going to be taking center court at Wimbledon anytime soon. The video proves it. It’s fun, self-deprecating and gives you some insight into his personality off the field. Why should you care? Look at this from another perspective. Think of USC as your company and Barkley as the CEO… or the maybe the top sales guy… or the chosen “face” of the company. How great would it be to humble that person a bit by forcing them to do something outside their comfort zone? How about a video series where that person takes on different jobs around the company? What a great way to humanize the company and show customers/prospects your willingness to have a little fun. Barkley’s willing to do it. Who’s willing on your team?